Wonderfully eclectic and quirky the armadillo candle holder will add humour to your coffee table displays and centrepieces. A quirky little guy the candle holder features an intricately detailed armadillo made from brass metal with candle holder on his back perfect for your dinner candles or pillar candles. The Brass Armadillo Candle Holder measures 17cm x 8cm x 20cm. We think that you will love our lovely little armadillo candle holder because he’s such a great talking piece that will put a unique stamp on your home interiors. What’s more, because he is such a quirky animal candle holder we also think that he would make a great gift idea for animal lovers or anyone who likes imaginative décor or display pieces in their home. Brilliant and unique, candle holders can be styled anywhere. 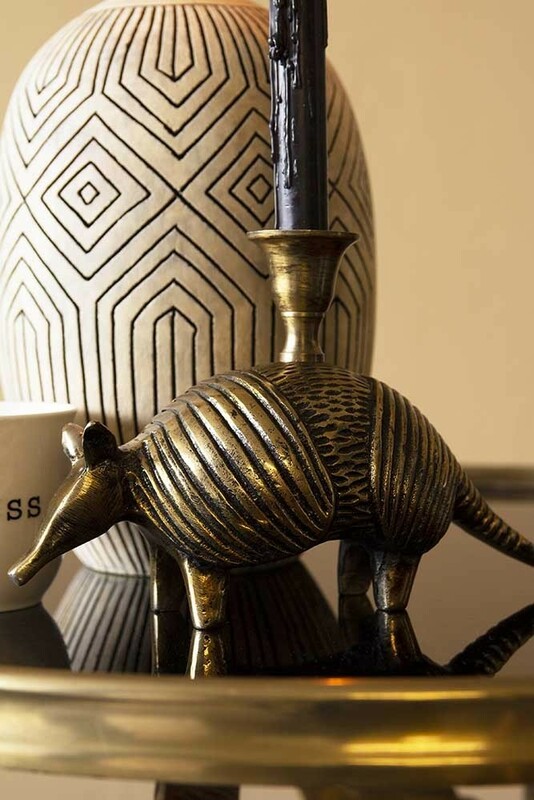 So style your armadillo on your mantelpieces, windowsills, coffee tables, side tables, dining tables and bedside tables. You could even pair this Armadillo Candle Holder with our Kiwi Candle Holder and Ram Candlestick Holder for a super eye-catching display.